Want some mac and cheese with that Big Mac? McDonald's (MCD)is experimenting with a limited roll-out of mac and cheese, a tried-and-true comfort food that recently appeared on McDonald's menus. McDonald's is offering mac and cheese in only 18 restaurants in the Cleveland area of Ohio, which has quietly served as a test market since the summer. "We're always looking for new ways to offer relevant tastes to our customers, so we're giving mac and cheese a try and gathering valuable feedback from our customers," said McDonald's spokeswoman Lisa McComb. McDonald's sells mac and cheese Happy Meals for $3. Mac and cheese is the entrée, alongside fries, fruit and milk. The four-ounce portion has less than 200 calories, with five grams of protein and five grams of whole grains, according to the company. 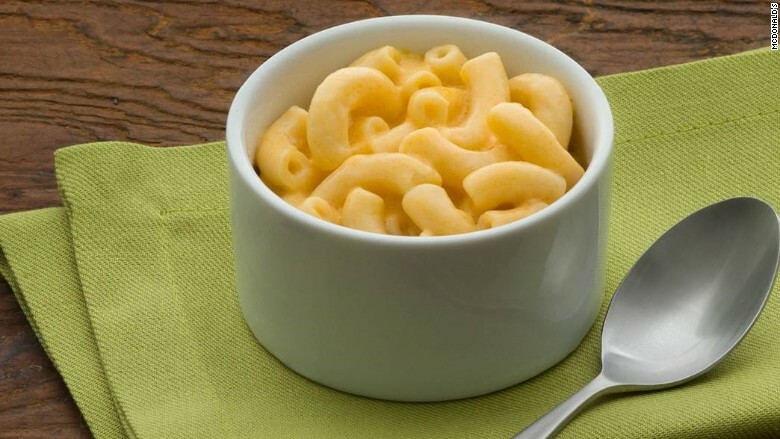 Since November, McDonald's has also sold mac and cheese separately for $1.75. McComb said it will be served through February. And after that ... who knows? "We'll then use the feedback from our customers to see what happens after that," she said. "It's premature to draw any conclusions from this test and it wouldn't be appropriate to speculate on it being offered anywhere else." In October, McDonald's altered its menu by offering all-day breakfast, and in the U.K. it is trying out a thicker, premium burger made to order.